McLaren is to produce a new high performance variant of its 12C sports car for track use only. As with the 12C road car, the 12C GT Sprint will be based on a carbon fibre composite chassis. The 12C GT Sprint has been designed by McLaren GT, the race car building arm of the McLaren Group, and retains many of features of the 12C road car, including the carbon fibre composite MonoCell chassis. 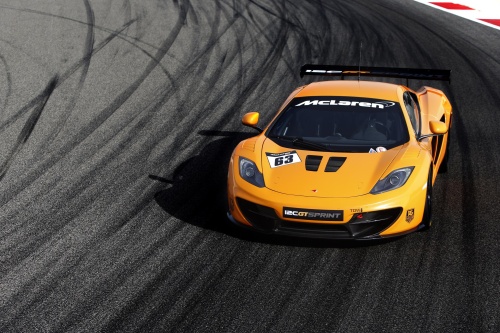 The GT Sprint track-only model signifies the continued development of the 12C model, and bridges the gap between the 12C, which can be used on both road and track, and the racing 12C GT3 and 12C GT Can-Am Edition models. A range of bespoke options include a CFD (computational fluid dynamics) developed aerodynamic package including carbon fibre rear wing and front splitter, and further lightweight components including a polycarbonate windscreen. The 12C GT Sprint, finished in heritage McLaren Orange as standard, will make its world premiere at the 2013 Goodwood Festival of Speed motor sport event on 12-14 July at Goodwood, UK. An initial batch of 20 cars will be delivered in 2013, available from McLaren retailers at a price below £200,000 (excluding tax).